Check out this: “Backtracking Birds Show Islands are not Evolutionary Dead End” on the blog A Scientific Life (or Scientist, Interrupted), aka girlscientist.blogspot.com. 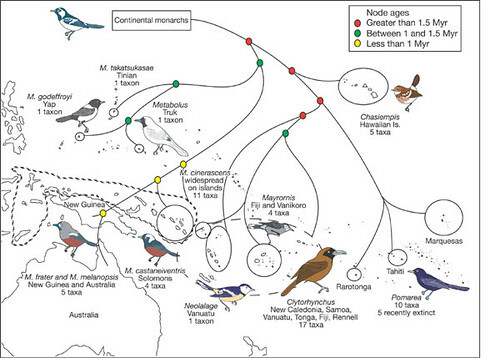 The post reports on a paper on bird biogeography published in Nature, “Single origin of a pan-Pacific bird group and upstream colonization of Australasia.” The main point of the paper is that the biogeogaphy of a group of pacific island monarchs is not a simple matter of flow from the continental source to the island sink; instead, there has been some back-and-forth over the last few million years. This spiffy map overlays the phylogeny and the biogeography. It is interesting that despite all the hop-scotching about, there is still (intuitively) a pretty significant correlation between phylogenetic relationship and geographic proximity).